He then goes to give a more detailed definition of what one’s word actually entails, and the key factors that often cause us to not see the costs of not honoring our word. But to me, the most profound lesson from the article is the important distinction between “keeping your word” and “honoring your word”. In collaborative interactions we are often times asked, either explicitly or implicitly, to keep our end of the bargain by completing the work the rest of the team depends on by a given time. And therefore, we often tend to commit, explicitly or implicitly to do just that. 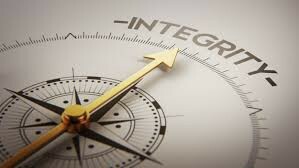 But committing to keeping our word sets us up to not be in integrity, since it assumes that we have complete control over the outcomes of our efforts. Which is rarely the case. Furthermore, when reality hits us in the face, and we realize that we won’t be able to keep our word, our commitment to keeping our word holds us back from letting our collaborators know that we won’t be able to do so, turning a bad situation into a worse one. But what what if instead we committed to honoring our word? When it turns out, that for reasons outside of our control, we are not going to be able to keep it — we will have no mental disincentive not to let our collaborators know, and we can help mitigate any negative effects. Honoring your word: “I commit to doing my best to have this draft ready for you by 4pm, and if it turns our that I’m unable to meet that deadline - let you know as soon as I can (and help fix the mess I caused)”. Which one of those responses sets us up better to be in integrity, and maintain a healthy collaborative relationship? So next time that you are asked to make a commitment — consider committing to honoring your word (rather than to keeping it).